OneNote isn’t just great as a note-taking and productivity app, it’s also easy to turn into a digital coloring book to distract bored young ones so that you can stay sane or focus on doing something else. 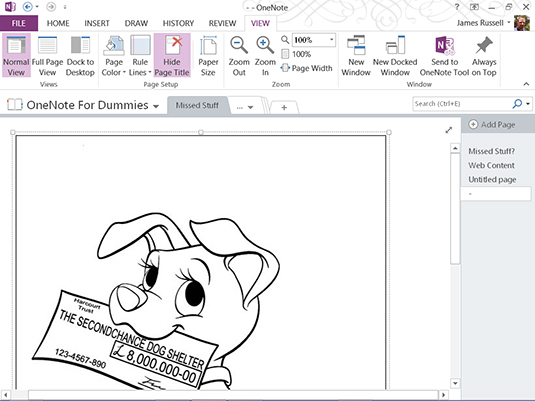 The following list shows you how to use OneNote for a coloring book. Note: Although it’s possible to color using a mouse and keyboard, it’s a painful experience to do so because the level of control with a mouse in no way equals the control you get holding a pen, and you get none of the pressure sensitivity of a pen. Coloring is most useful on a digital pen-enabled device such as Surface Pro. 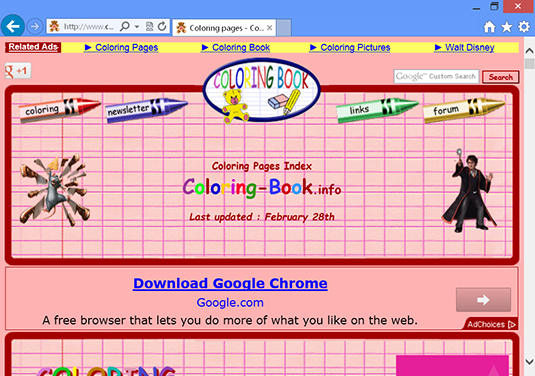 Go to a site such as Coloring-Book.info and find an image you want. You can find other sites just by Googling “coloring book pages,” but this site has some great ones, including some from Disney. Download the image by right-clicking or pressing and holding on it and choosing Copy or Copy Image, depending on your browser. The image is copied to your PC’s Clipboard. 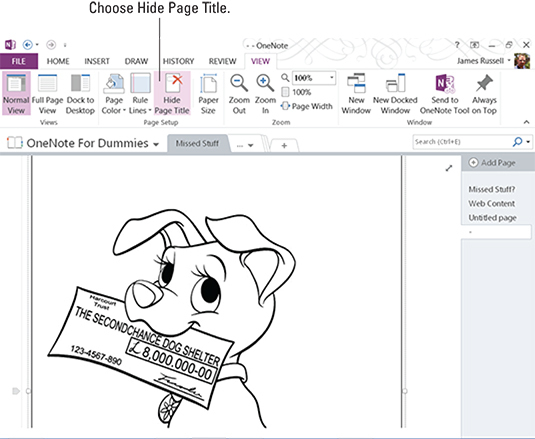 Open a new note page in OneNote, right-click or press and hold on the blank page where you want the image to appear, and choose Paste Options and then Picture. The image appears on the page. Select the View tab and choose Hide Page Title. The page title disappears from the upper-left of the page. Click or tap the bottom arrow to the right of the Favorite Pens section of the Tools section of the Draw tab. 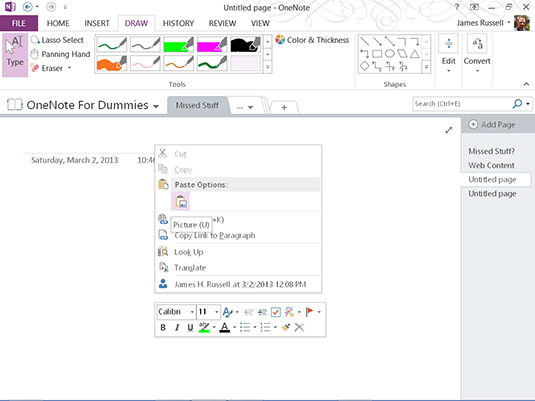 Select Pen Mode, and choose Create Drawings Only. OneNote won’t waste processing cycles trying to guess what words you’re trying to write because by doing this you’re telling OneNote you’re not writing. Click or press and hold on the drawing to move it around or up into the top-left corner to position it as desired. Give your child a brief tutorial on how to use the pen and drawing tools. Work with the built-in pens and highlighters. Create favorite pens just by changing a built-in one—a new favorite pen appears automatically when you press OK after changing an existing one. Change the color and thickness of the pen using the Color & Thickness command to the right of the pens box in the Tools section of the Draw tab. 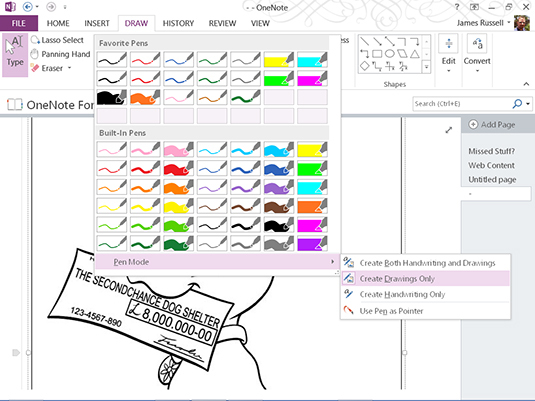 Erase stuff using the Eraser drop-down menu to the left of the pens box in the Tools section of the Draw tab. Change the orientation of the device from portrait mode to landscape mode and back if using a Surface Pro or similar device. Press lighter or harder to change the thickness of ink strokes. 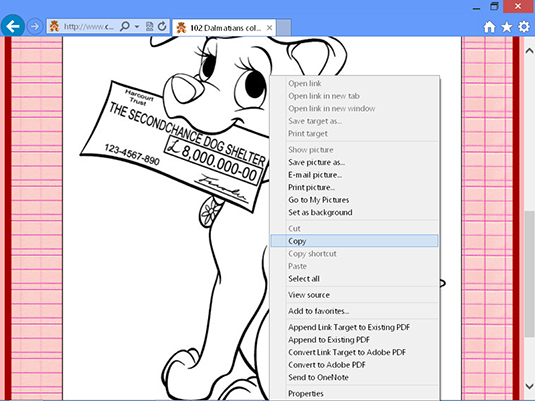 (Optional) Use a color printer to print your child’s OneNote drawing. You can proudly display the printout wherever you want, such as on the refrigerator.